“During the course of the hearing today, it seems that it has become essential for us to determine whether there is any fundamental right of privacy under the Indian Constitution. The determination of this question would essentially entail whether the decision recorded by this Court in M.P. Sharma and Ors. vs. Satish Chandra, District Magistrate, Delhi and Ors. - 1950 SCR 1077 by an eight-Judge Constitution Bench, and also, in Kharak Singh vs. The State of U.P. and Ors. - 1962 (1) SCR 332 by a six-Judge Constitution Bench, that there is no such fundamental right, is the correct expression of the constitutional position. Before dealing with the matter any further, we are of the view that the issue noticed hereinabove deserves to be placed before the nine-Judge Constitution Bench. List these matters before the Nine-Judge Constitution Bench on 19.07.2017. Liberty is granted to the learned counsel appearing for the rival parties to submit their written briefs in the meantime. “The 9-Judge Bench comprises of Chief justice of India, Justices J Chelameswar, SA Bobde, RK Agarwal, Rohinton Fali Nariman, Abhay Manohar Sapre, Dr DY Chandrachud, Sanjay Kishan Kaul and Abdul Nazeer. The judgments in the Kharak Singh case of 1950 and M.P. Sharma case of 1962 had underlined stated that there was no explicitly articulated Fundamental Right to Privacy written in the Constitution using the word “Privacy’. The fact is that a Constitution of India comprises of both written text and unwritten text. The latter is revealed through judicial decisions. As far as Fundamental Right to Privacy and Basic Structure is concerned they get revealed by jurisprudential imagination. A care reading of previous relevant judgments underlines that there was no need for the Court to send the matter of Right of Privacy to a bench larger than five judges, because five judges can interpret the rulings by six judge bench in Kharak Singh vs. State of UP and others, and the seven judge ruling in Maneka Gandhi vs. Union of India & Another, validate the five judge bench of Satwant Singh Sawhney vs. D. Ramarathnam, Assistant Passport Officer, Government of India, New Delhi & Ors, and confirm the three judge ruling in Gobind vs. State of M.P. & Another, in R. Rajagopal & Another vs. State of Tamil Nadu & Others, Sharada vs. Dharampal, Selvi & Ors vs. State Of Karnataka & Anr and the two judge ruling in District Collector v. Canara Bank cases. The eight judge ruling in M.P. Singh & Others v. Satish Chandra & Others case is clearly inapplicable, and the five judge bench can assert that it does not need to be overruled to decide that there is a Right to Privacy. In Kharak Singh vs. The State of U.P., in his order Justice Subba Rao wrote, "An illustration will make our point clear. A visitor, whether. a wife, son or friend, is allowed to be received by a prisoner in the presence of a guard. The prisoner can speak with the visitor; but, can it be suggested that he is fully enjoying the said freedom? It is impossible for him to express his real and intimate thoughts to the visitor as fully as he would like. But the restrictions on the said freedom are supported by valid law. To extend the analogy to the present case is to treat the man under surveillance as a prisoner within the confines of our country and the authorities enforcing surveillance as guards, without any law of reasonable restrictions sustaining or protecting their action." In the UID/Aadhaar case, the contention of the Union of India is that implied and empowered surveillance is not a civil liberty restriction. It is indefensible. In Gobind v Madhya Pradesh, Justice Mathew stated that the Right to Privacy flows from Article 19 (1) (a) (freedom of speech and expression), (d) (freedom of movement) and 21 (right to life and personal liberty). Privacy or the right to be let alone is inherent in Article 21. This has been stated in R. Rajagopal v. State of Tamil Nadu (Auto Shankar Case) and PUCL v Union of India. In the PUCL case, the Court laid down guidelines for interception under Section 5 of the Telegraph Act, 1885 in pursuance of the same right. There is a compelling reason for the Court to apply the doctrine of prohibition of “unconstitutional condition” which means any stipulation imposed upon the grant of a governmental privilege which in effect requires the recipient of the privilege to relinquish some constitutional right. The submission of Union of India demonstrates that it is unreasonable in a special sense because UID/Aadhaar takes away or abridges the exercise of a right protected by the Constitution. In Ahmedabad St. Xavier's College Society v. State of Gujarat, (1974), the Court has drawn on a verdict from US Supreme Court in Frost and Frost Trucking Co. v. Railroad Comm to hold that State does not have the right to impose conditions which require the relinquishment of constitutional rights. If the state succeeds in compelling the surrender of one constitutional right as a condition of its favour, it may, in like manner, compel a surrender of all. It is inconceivable that guarantees embedded in the Constitution be manipulated out of existence. It is evident that the implementation of UID/Aadhaar is an exercise which is forbidden by our Constitution. If this could be done, constitutional guarantees, so carefully safeguarded against direct assault, are open to destruction by the indirect, but no less effective, process of requiring a surrender, which, though in form voluntary, in fact lacks none of the elements of compulsion. State does not have the constitutional power to discontinue benefits due to citizens. State’s power to withhold recognition or affiliation altogether does not carry with it unlimited power to impose conditions which have the effect of restraining the exercise of fundamental rights. Infringement of a fundamental right is nonetheless infringement because it is accomplished through the conditioning of a privilege. If a Legislature attaches to a public benefit or privilege restraining the exercise of a fundamental right, the restraint can draw no constitutional strength whatsoever from its being attached to benefit or privilege. This is applicable to the Aadhaar Act, 2016. Notably, Re Kerala Education Bill (1958) was the first case in India to lay down the doctrine of the prohibition of “unconstitutional conditions“. The doctrine of unconstitutional conditions prohibits the State from denying citizens a benefit by making access to that benefit conditional upon citizens’ abstaining from exercising any or all of their fundamental rights. 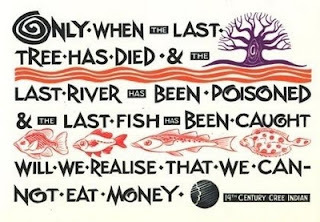 This is despite the fact that there is no antecedent right to that benefit in the first place. 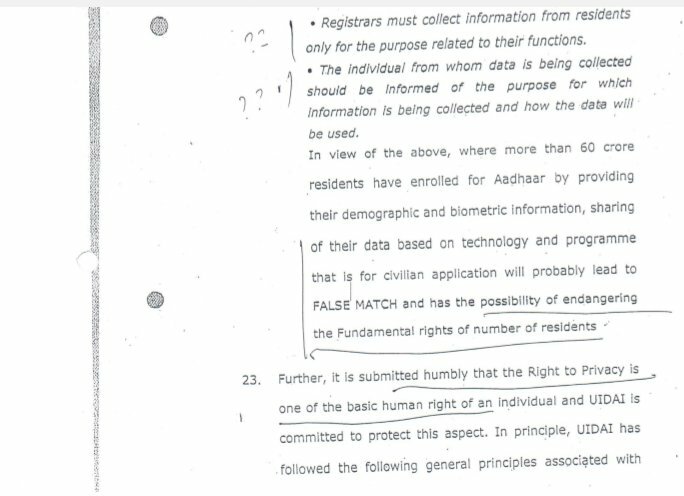 It emerges that no Central or State Government can coerce citizens to access subsidies by sacrificing their private data by enrolling for UID/Aadhaar given the fact that they have a right to subsidy. No Government has the constitutional power to make right to have rights condition precedent. Apparently, under some external influence, Central Government’s stance has been insincere from the every outset. The total estimated budget of the biometric UID/Aadhaar number project has not been disclosed till date. In any case unless total estimated budget of the project is revealed all claims of benefits are suspect and untrustworthy. 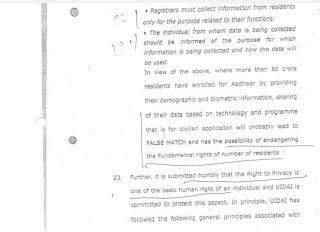 After the trashing of UID/Aadhaar by Lok Sabha’s Parliamentary Standing Committee on Finance and later by Rajya Sabha, the Constitution Bench of Supreme Court too will now have the opportunity to see through the coercive and unconstitutional nature of UID/Aaadhaar Number project when it decides some 25 cases challenging it. In the course of the arguments and discussion in the Court the entire focus was on Articles 19 and 21 of the Indian Constitution. In an affidavit in Supreme Court by the Central Government, it has been submitted that Right to Privacy is a basic human right. (see the scan of relevant text of Unique Identification Authority of India).